MURTAUGH, Idaho -- Farmers in Southern Idaho often pump from wells hundreds of feet deep to irrigate their crops. It's expensive, and groundwater wells have contributed to dwindling aquifer levels. One irrigation district has taken aggressive steps to idle some of its deep wells and to switch farmers to surface water instead. The South West Irrigation District recently completed work on a pipeline project that stretches from the Snake River near Burley to an area north of Oakley. Water from the pipeline will replace about 15 deep wells, each about 500 to 600 feet deep. The project includes a main pumping plant near the river, a booster station and about 44 miles of pipeline. It's the latest in a series of groundwater conversion projects undertaken by the irrigation district in recent years. It's also the largest and most expensive. 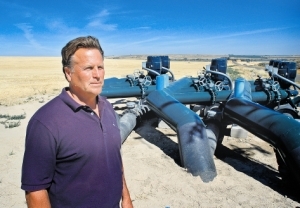 "It's probably the biggest irrigation pipeline project in the state," said Randy Brown, a farmer from Murtaugh, Idaho, and a member of the South West Irrigation District board of directors. Construction of the $6.5 million West Cassia Pipeline LLC project began earlier this year before planting and wrapped up in mid-August. The project was on a fast track. The first of more than 200 semi-truck loads of pipe arrived even before all the easements were purchased. About 7,500 acres of cropland that had been irrigated with groundwater will now be switched to surface water. Farmers will continue to use their pivot-irrigation systems, but they won't have to lift water from hundreds of feet underground anymore. The main pumping station was constructed along a wastewater drainage connected to the Snake River under a cooperative agreement with the Burley Irrigation District. The surface water will come from two sources: Burley Irrigation District wastewater and the Snake River via lease agreements with other irrigation districts. "We couldn't have done this without them," Brown said of the other irrigation entities. Electronically controlled weirs and flow meters will be used to measure the amount of water by source as it flows into the pipeline. "It will provide instantaneous measurements so anybody can see what's going on at any given time during the day," Brown said. The new system is expected to replace about 15,000 acre feet of groundwater each irrigation season. The irrigation district will get credit for the water as part of its state-ordered obligation to help fish farms harmed by groundwater pumping. Another advantage of the project is an estimated power savings of 30 to 40 percent, Brown said. The idled deep wells should also benefit domestic wells and any other irrigation wells still operating in the area. Despite its advantages, the project wasn't an easy call for the district and participating irrigators, Brown said. They're footing the bill themselves; no government funding was used. There's also the uncertainty about how much surface water will be available for lease in the future and at what price. "There's no guarantee that that water will be there every year," Brown said. "It's been a gamble for everyone." But it's a gamble that the district was willing to take given the critical state of groundwater levels in the area. The only certainty is that things would get even worse if irrigators continued to do what they've been doing. "It would be dry ground after awhile, and what's dry ground worth out there?" Brown said. Dave Wilkins Staff writer is based in Twin Falls, Idaho.